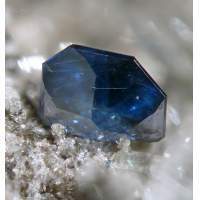 There had been no mineralogical society in Britain since the short-lived British Mineralogical Society came to an end in 1806. Many mineralogists had joined the Geological Society of London and contributed papers to its publications for several years. A second proposal form was circulated later and the list of ‘first’ members in this was much longer. Many of these, seventeen of them, were members of the Scientific Club at 7 Saville Row, which was managed by Captain Marshall Hall, and it was at this club on Hall’s invitation that the inaugural meeting was held on 3 February 1876. At the meeting, Henry Clifton Sorby presided and it was resolved to form a society to advance the study of mineralogy and petrology to be called ‘The Mineralogical Society of Great Britain and Ireland’. The Society was to consist of Ordinary Members, Associates, and (Overseas and Foreign) Corresponding Members. Sorby was elected President, J. H. Collins Secretary and Editor of the Magazine, R. P. Greg, Treasurer, and Professors Houghton and Heddle Vice-Presidents.